Hog-Eye Men, The | The Goose Is Out! We hope to have a photo of all five of them soon! 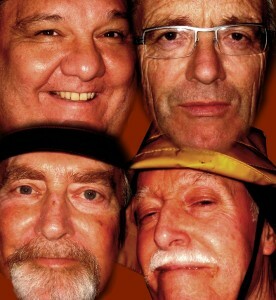 David West and David Rees have previously sung with London based The Shanty Crew and together with veteran performer Brian Catchpole and comparative newcomers Jon Pugh and Chris Bennett, they now sing together as The Hog-Eye Men. They share a passion for keeping the tradition of these songs of the sea alive. Here are their individual bios! Brian Catchpole is a commuting cyclist, calligrapher, crooner and shanty singer. A man of many parts, and, though of a mature age, most of his parts are still in working order. He has a penchant for comic songs, and a well-developed comic paunch. The theatre may be in his blood; his blood is certainly in some theatres. David West found shanties through sailing dinghies and yachts. He was one of the original members of ShantyCrew and performed at the St Katherine’s Dock alongside the father of modern shanty-singing, Stan Hugill. He formed The London Shantymen, busking and singing in London and around the country. He recently rejoined the ShantyCrew just prior to the formation of the Hog-Eye Men. Jon Pugh (aka TINY or FNG!!!) is the newest (if not smallest) Hog. His love of song reflects a colonial military upbringing and hints at a northern background. With a soft & subtle singing voice, Jon is a relative newcomer to the shanty scene. Never far from a good rant or a good ale, he also bashes a drum and occasionally sticks, for border side Motley Morris. David Rees sung from 2004 – 2007 in ShantyCrew. His first shanty performance was to naval ratings in Plymouth, teaching the importance of singing loudly and not giving up. He has sung in The Shanties Festival, Krakow, and on the clippership Pommern in Mariehamn, Finland. Architect by day, lover of the human voice, and (to his cats) a towering intellectual in his own back garden. Chris Bennett has performed folk music for a number of years. He sings both traditional and modern songs. He performs solo and before joining Hog-eye Men, he also performed with Shanty Crew, London Shanty Men, and Foc’sle. In October 2008 Chris published a folk music book ‘Historical and Political Ballads and Songs of the Stuart Era”.